Its been over a week since my last adventure (acute urinary retention) and bouncing back I am not. It seems the cellulitis (x3), the kicking off of my symptoms in February and the latest thing to add to the catalogue of disasters that 2014 has brought, acute urinary retention has depleted any energy reserves I had as back up. I am back to a state I last saw in early 2007 / 2008, where just getting up and showering is a major achievement. Frustrating doesn’t even seem to cut it. It seems 2014 doesn’t want to allow me any steps forward but is keen to make all the steps I do take are backwards. I used to bounce back within a week or two from events such as these. I knew bed rest and cutting back on activities would “reset” my system. It seems that function is no longer available. I am sleeping most afternoons and adding that to what I am sleeping at night and its getting on for over 13 hours a day. Something I haven’t done for such a very long time. I know that this means that I am very sick or recovering from being very sick. Since being catheterised and it subsequently being removed, for over 7 days I was left with reasonably painful bladder spasms that werent really responding to buscopan or opiate painkillers. The only relief I could get was a hot water bottle and to lie down. Only that always kicks my back off especially when you add into the mix that I have been sleeping for 13 hours plus a day. And my electric blanket appears to have died. I didnt think that things could get much worse lol! Every part of my body is aching, I am struggling to think straight. I have transient moments when I can converse proficiently but the rest of the time I am struggling to follow a conversation or understand most things my husband is trying to talk to me about. Fun it is not. I am hoping that scaling back on my activities (not that they were vast anyway) and spending more time resting will do the trick. When you have been stable for a few years and then suddenly take a nose dive its scary. Add in that the doctors don’t know why my condition is deteriorating or why its come about in the first place? It makes for a bumpy ride. I try not to spend too much time navel gazing as it gets me nowhere. My mood is low, which is hardly surprising with so much being thrown at me at the moment. I am not depressed I am reacting in a natural way to the events taking place in my life. I can still laugh, smile and look forward to things in the future. I am still enjoying all the things that I always have. I am just so very sick and tired of being sick and tired at the moment. I apologise for this being such a “down” post. My blog post was completed towards the end of last week and I am happy to report my mood has lifted. Probably helped by spending the day with a dear friend celebrating her birthday. 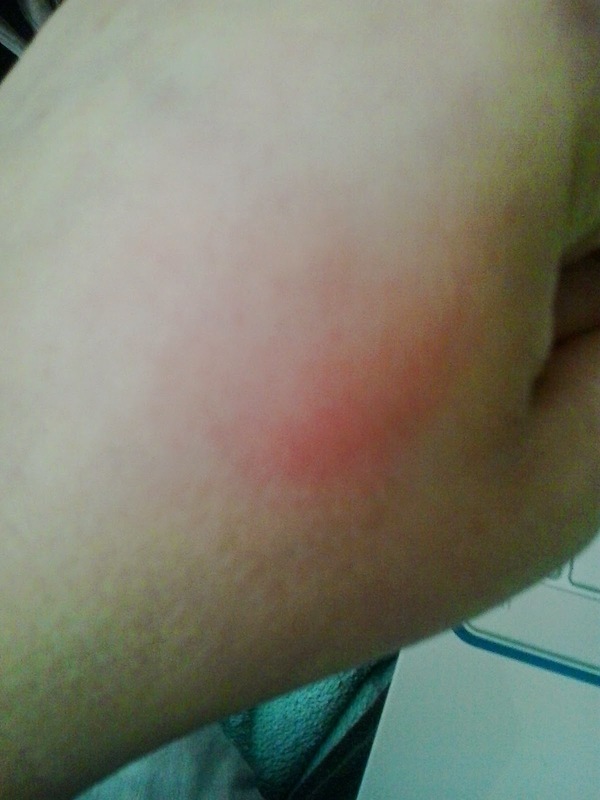 Unfortunately on Monday night (30th June) a mosquito or mosquitos decided to bite me 4 times. 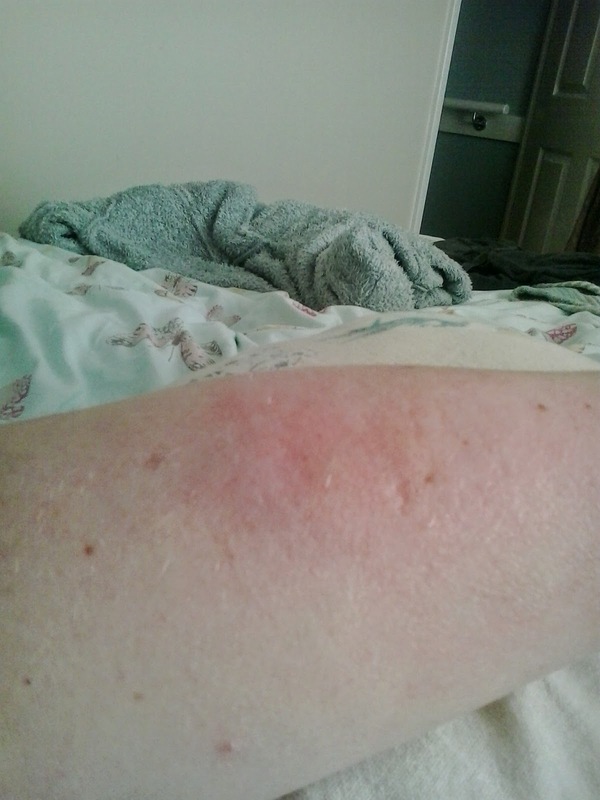 You can probably guess what I am going to say next……cellulitis, although it could be Skeeter Syndrome. 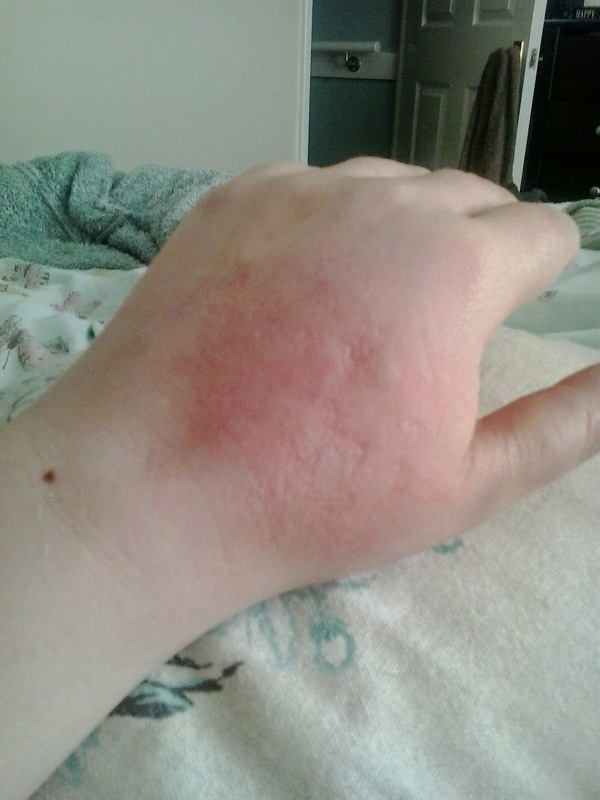 I have one bite on the back of my left hand, that has made it swell up so much you would think I had broken it. 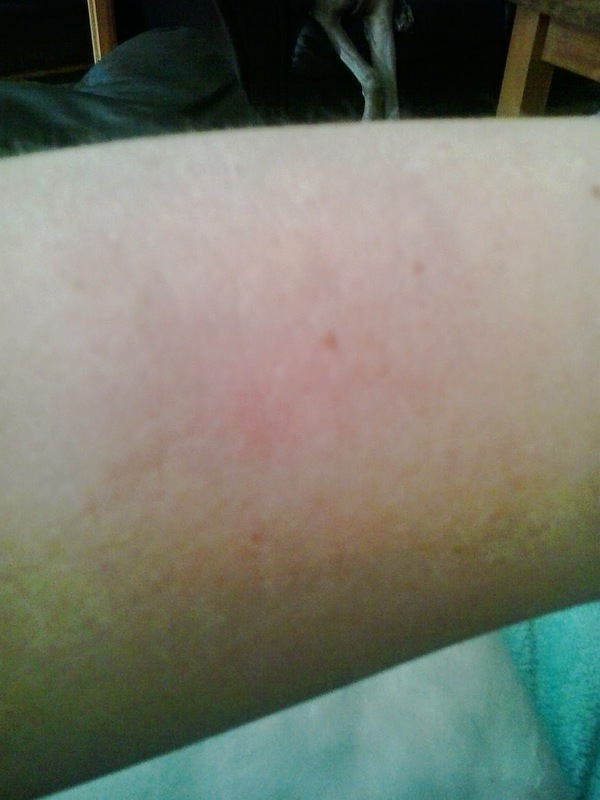 Two further down my left arm that have also ballooned and one on my flank which is now deciding to swell and is 5cm in diameter. I am currently waiting for my gp to ring (its got so frequent now that the surgery staff no longer confirm my telephone number!). So more antibiotics and possibly prednisolone will be thrown into the mix. Its never a dull moment here! I am now on antibiotics for the next seven days and have to have a load of blood tests done next week. I enjoy reading your blog. But when it popped up in my e-mail that there was a new post I thought oh no I hope she has not had to go back to the hospital. I won’t say I know how you feel, because that tends to throw me over the edge when people say it to me when it is like comparing apples to oranges. However, I am feeling the similar mindset these days. I had a surgery 5 weeks ago to improve my condition. The average recovery time is 6-8 weeks.Last week I had to have about 40-50 botox injections in my neck, head and back. I can deal with a lot but I was down and out for at least three days. Additionally I am on antibiotics with you. 🙂 for a possible infection at the surgical site. I know it will improve but I feel like I have taken a thousand steps back and I am pretty much in bed most of the time. Best wishes for a better tomorrow. I always say to people I can deal with my normal crappy level of health, as I’ve got used to it. I just cant cope this year with the level of curve balls that are being thrown. Mentally (even with the cellulitis) I am in a better place than I was when I wrote the post. Then I had got to the point of being sick and tired of being sick and tired. I am sleeping better and not so much now. So I am more with it. I am really hoping that you start to feel better soon. 40-50 botox injections, omg you deserve a medal hun! Sometimes it hard to be patient waiting for improvements in your health to come and I think thats where I was last week. I am much more stable again now and I am hoping that this will be the case for you as well. I have everything crossed for you. Normal service will resume Monday, so you will find out what I have been up to! Causing trouble as usual. Just need to ask someone’s permission before I write the post. I don’t like putting stuff out there in the big wide world if its not me directly that I am writing about. I’ve made that mistake before! Thanks Bee, I hope we both start improving soon. I am certainly glad that you are in a better place. I will look forward to your next entry. I am glad to know that it will not be a hospital entry. I am used to the botox injections. It was just on top of everything else and recovering from them. I know what you mean, just one more thing and then everything is just too much to deal with. It makes you feel very helpless and vulnerable and reminds you that you are constantly walking a tightrope between “stable” v “unstable”. Unstable can be very scary. Ive had the permission granted for the next post, need to do a little research and then I will be typing away ready for Monday’s blog post. Then as soon as thats completed I will panic about Thursdays. Its a nice panic though if there is such a thing.